Compared to the preceding poets in this anthology, Sarumaru is relatively unknown. The only things really known about him is that he lived no later than 800AD, and that his time active as a Second Assistant Minister was from approximately 708 – 715. Apparently, he was also a member of the Thirty Six Poetic Sages (according to Wikipedia). However, there’s so little known about him, that some scholars suggest that this Sarumaru never really existed, and was instead an alias for Prince Yamashiro no Oe (also according to Wikipedia). 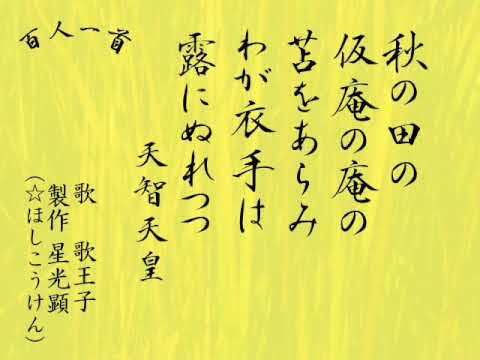 In any case, this tanka that Sarumaru has created is a classic example of Autumn poem (秋歌). Although there are, once again, no notes on this tanka, it is clear that both crimson leaves – presumably maple – and deer are symbolically synonymous with Autumn in Japanese culture. And with the deer’s cry ringing through the sadness and emotion that the poet can feel, you can almost feel the sadness for the passing of Summer and warmer, brighter times and the loneliness that the port anticipates with the onset of harsh Winter. What’s interesting though, is that the last tanka expressed the awe-inspiring beauty of cold clean Winter, while the beauty of Autumn is described here with a little melancholy. Even though both poets were inspired by different emotions as they absorbed scenic nature surrounding them, already it is clear that nature and scenery and the environment and things are important to Japanese culture. And now that I’m soon going to be in Japan, it’ll be amazing to see how it translates from these ancient tanka to modern Japan. Supposedly, the emperor was inspired to write this poem when he was scaring birds away while harvesters were gathering crop in the fields. However, sudden rain forced to him to take shelter in a thatched hut that offered zero protection from the rain anyway, and so he and his sleeves became wet. According to my translation, the vignette is of a hard working harvester wiping away his sweat with his sleeves as he takes a rest in a hut. Or that the speaker is separated away from his love as he sits alone in a hut, wiping away his tears with his sleeves. Since the Japanese are all for meaning upon meaning, layer upon layer, I personally like the idea of the forlorn lover in a hut. And since Autumn is a symbol of loneliness, of drifting away from the warm brightness of Summer, and harvesting is usually a solo activity, who knows? The Emperor could have been travelling on the road, passing by fields full of lone harvesters and something unexpected forced him to take shelter in a road side hut, delaying his return to the side of his beloved person.